Robert the Magnificent (French: le Magnifique)[lower-alpha 1] (22 June 1000 – 1–3 July 1035), was the Duke of Normandy from 1027 until his death. Owing to uncertainty over the numbering of the Dukes of Normandy he is usually called Robert I, but sometimes Robert II with his ancestor Rollo as Robert I. He was the father of William the Conqueror who became in 1066 King of England and founded the House of Normandy. He was the son of Richard II of Normandy and Judith, daughter of Conan I, Duke of Brittany. 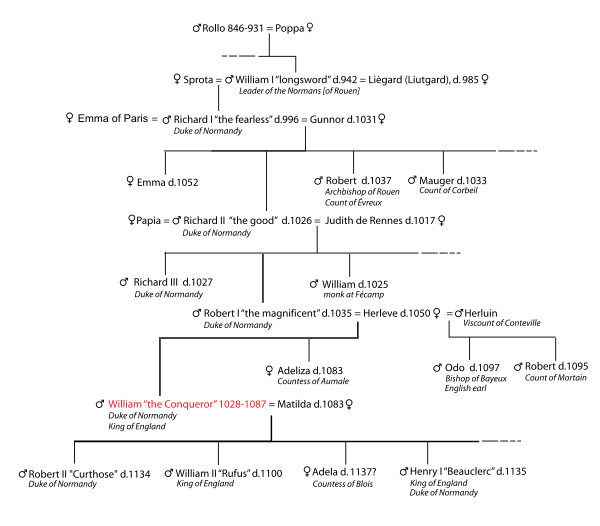 He was also grandson of Richard I of Normandy, great-grandson of William I of Normandy and great-great grandson of Rollo, the Viking who founded Normandy. 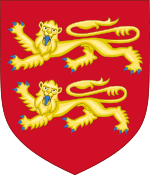 Before he died, Richard II had decided his elder son Richard III would succeed him while his second son Robert would become Count of Hiémois. In August 1026 their father, Richard II, died and Richard III became duke, but very soon afterwards Robert rebelled against his brother, was subsequently defeated and forced to swear fealty to his older brother Richard. Robert's attitude towards the Church had changed noticeably certainly since his reinstating his uncle's position as Archbishop of Rouen. In his attempt to reconcile his differences with the Church he restored property that he or his vassals had confiscated, and by 1034 had returned all the properties he had earlier taken from the abbey of Fecamp. After making his illegitimate son William his heir, he set out on pilgrimage to Jerusalem. According to the Gesta Normannorum Ducum he travelled by way of Constantinople, reached Jerusalem, fell seriously ill and died[lower-alpha 2] on the return journey at Nicaea on 2 July 1035. His son William, aged about eight, succeeded him. ↑ He was also, although erroneously, said to have been called 'Robert the Devil' (French: le Diable). Robert I was never known by the nickname 'the devil' in his lifetime. 'Robert the Devil' was a fictional character who was confused with Robert I, Duke of Normandy sometime near the end of the Middle Ages. See: François Neveux, A Brief History of the Normans, trans. Howard Curtis (Constable & Robinson, Ltd. London, 2008), p. 97 & n. 5. ↑ The question of who her mother was seems to remain unsettled. Elisabeth Van Houts ['Les femmes dans l'histoire du duché de Normandie', Tabularia « Études », n° 2, 2002, (10 July 2002), p. 23, n. 22] makes the argument that Robert of Torigny in the GND II, p. 272 (one of three mentions in this volume of her being William's sister) calls her in this instance William's 'uterine' sister' (soror uterina) and is of the opinion this is a mistake similar to one he made regarding Richard II, Duke of Normandy and his paternal half-brother William, Count of Eu (calling them 'uterine' brothers). Based on this she concludes Adelaide was a daughter of Duke Robert by a different concubine. Kathleen Thompson ["Being the Ducal Sister: The Role of Adelaide of Aumale", Normandy and Its Neighbors, Brepols, (2011) p. 63] cites the same passage in GND as did Elisabeth Van Houts, specifically GND II, 270–2, but gives a different opinion. She noted that Robert de Torigni stated here she was the uterine sister of Duke William "so we might perhaps conclude that she shared both mother and father with the Conqueror." But as Torigni wrote a century after Adelaide's birth and in that same sentence in the GND made a genealogical error, she concludes that the identity of Adelaide's mother remains an open question.